I didn't play this sooner! A fantasticly gripping storytelling experience which will have you on the edge of your seat and wanting more. I am of course talking about season one of Telltale Games’s The Walking Dead, which is available on most gaming platforms. I am specifically referring to the Xbox 360 edition in this review however, as it is (at least until the end of this week) completely free as a part of Microsoft’s Games for Gold initiative and their Shocktober event. You can imagine my hesitation at looking to play a videogame that may contain potential series spoilers, but I was relieved to discover that not only is this game based more closely on the comic book series, but is also set as a prequel to the major events of both comic and TV version. Ooh he’s a tough cookie. In this game, players take on the role of Lee Everett, a former University professor. The game begins with Lee under arrest, the car hitting a Walker, crashing and then the expected “Let’s not use the Z word even though the game does at points” shenanigans ensue. Very quickly after the game’s opening sequence of getting used to the controls (which flows very nicely and gives you a real feel for how the game is going to pan out from a playing perspective), Lee meets Clementine and it is here that we begin to get really invested in things. She’s the real reason we’re here. This game is, as with other TTG offerings, more of an interactive storytelling experience, where the player’s choices influence the progression of the story. 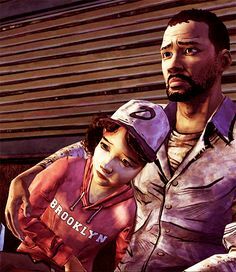 Clementine is used in this respect to great effect, acting as a moral compass for the player as Lee takes on her guardian role and she learns from his words and actions. Still, better late than never. This game has fully grabbed me and I found myself genuinely struggling to make some of the harder choices, such as which NPC lives or dies in certain situations, and this isn’t made any easier by the addition of a time limit, forcing snap judgements on the player which will then alter the remainder of the game. Fascinatingly though, at the end of each episode, the game will tell you how your decisions stacked against the rest of the world’s players by showing you percentages of choices made. Also, interestingly, the majority of these decisions are very close, with very few being over 70% either way. Just some of the characters you can/will meet. Graphically speaking, this game definitely draws influence from the comic books, with its cel shaded animation and stylised characterisations and I really like this as a design choice by TTG as it is a reminder that this game is firmly set within the comic universe of TWD as opposed to the show, and it allows the game to get away with a bit more from a shock and gore perspective. Overall, I cannot recommend this game enough. If you are a fan of The Walking Dead as a franchise, then this game is perfect for you. If you like zombies but aren’t really into TWD then still give it a try, as this is zombie survival at its purest form, with tough choices and engaging characters who you both love and hate. As a game, you can be left feeling a little alienated as your actual playing takes a back seat to the story as it unfolds, but as a narrative experience this is one of the finest pieces of storytelling I have ever experienced and it still holds up today! And as I said in my opening, until the end of the month this game is completely free with a Gold membership on Xbox 360 (or through til November 15th if you have an Xbox One). Until next time, happy hunting, conserve your food and ammo and always go with your gut instinct. I can’t wait to sink my teeth into Season 2!